The thing no one prepared me for about motherhood was how little by little over harried days and sleepless nights, you stop thinking about yourself. At first you’re consumed with how to keep this little being alive, how to hold him right, how to wrap his swaddle. Then countless hours trying fruitlessly to understand and anticipate his needs. Maybe he’s tired, maybe he wants to wake up. Maybe he is waking up because it’s too noisy or maybe he needs more white noise. Why can’t I sleep. Why couldn’t we have had a kid that slept more. Pointless hours that really never get you anywhere but still time passes. And then somewhere between trying to pick out what size shoes a toddler wears and washing diapers and making grocery lists to take care of everyone, you realize you can’t remember the last time you got a haircut or took some time just to relax. A friend of mine told me once that after she had a kid she really didn’t care that much about her birthday anymore because she mostly spent time thinking about her kid. That sounded like sacrilege to me. I’m a big believer in the joy of birthdays but mine came and went last year and to be honest, I didn’t really care that much anymore. I mostly was thinking about my son and how lovely it would be to feel rested. I used to be obsessed with shoes, piling them high in my closet and agonizing over which new pair to buy. I used to love taking the time to spoil myself with a massage or leave yoga class thinking about nothing and anything at the same time with only myself to worry about. Now my head feels cluttered with the hows and whens and whys of nap times and snack times and little free time to aimlessly wander or wonder. So I took a recent lazy weekend morning to make this cake just because and only for myself. It felt good and like a much needed step to shifting the balance toward myself a little. Sure, I still spend my leisure time doing things that technically nourish and take care of others. 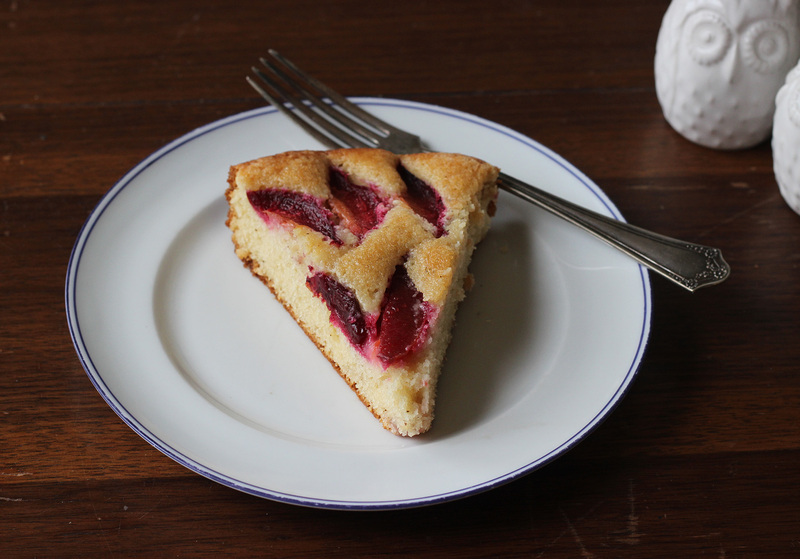 And I won’t hide the fact that the other impetus behind making this cake, besides wanting to eat something sweet, was the plums I had sitting on the counter rapidly over ripening. It’s hard to stop something you practice day in and day out. 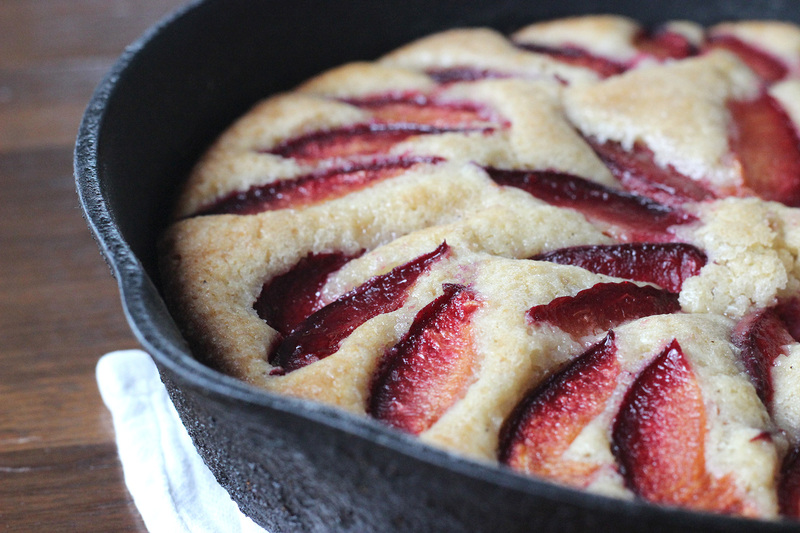 This cake is dead simple browned butter skillet cake. It takes no time at all to make, no real technique or skill. I could barely come up with a tip or trick to share with you. 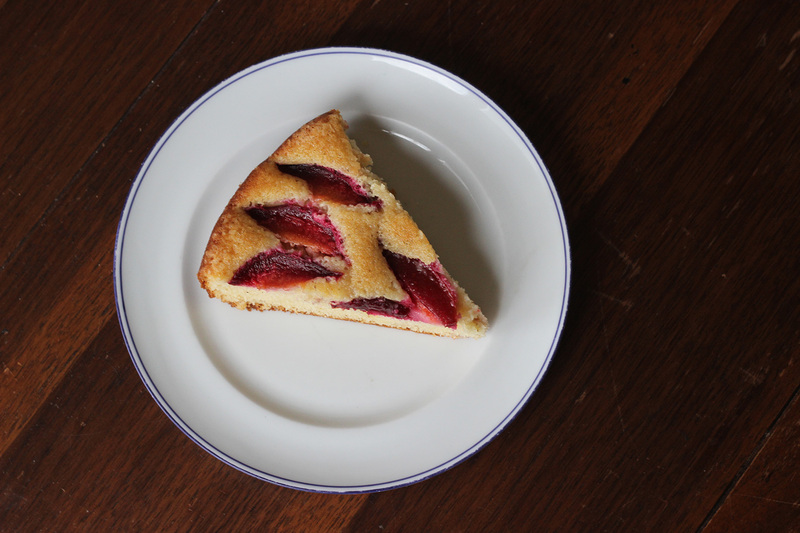 And it tastes delicious with little browned specks of lovely butter and slender slices of ripe summer plum swallowed up by a light buttermilk cake. It’s a cross between several recipes I’ve used before and one that spoils you in all the right ways. 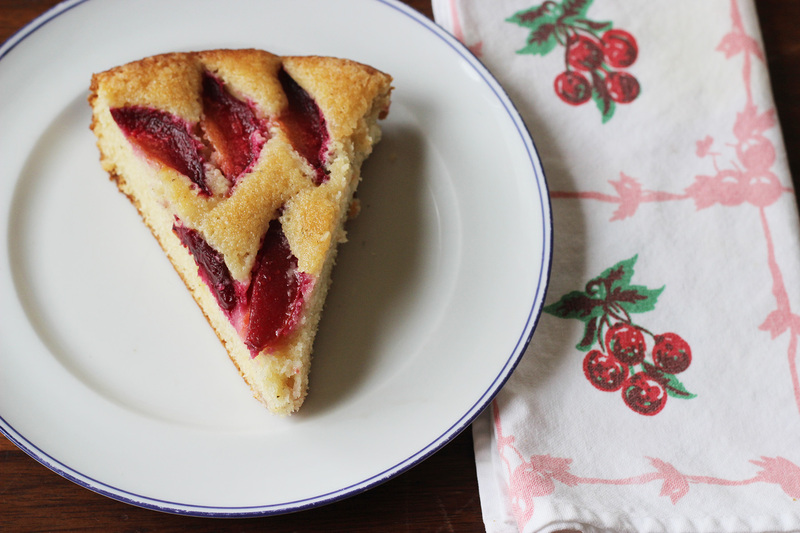 It’s easy to slice, easy to justify as cake for breakfast or an afternoon snack, and perfect for picnics or summer barbecues. Go ahead, sit down and enjoy a slice. You can even take the time to use an honest to goodness cloth napkin that hasn’t been used to wipe your toddlers pudgy fingers or grimy mouth. You might enjoy the time to yourself and use it to start thinking of other things you’d like to do just for you. I for one am going to look into a foraging class and maybe even sign up for a sewing class. Browning butter brings out not only a lovely brown color but also deepens the flavor of the butter and adds a slight nutty flavor. It’s fairly easy to brown butter but does take some careful attention since it’s easy to go from browned butter to burnt butter. Melt the stick in a medium saucepan over medium height. Every once in a while I pick up the pan and just swirl it a bit to mix the butter. The butter will begin to foam then the bubbles will subside. At this point, small, brown specks will begin to form at the bottom of the pan, the butter will start to shift from lighter golden color to a tan and then light brown color, and the butter will start to have a nutty aroma. At this point it time, your butter is successfully browned. Remove it from heat to prevent the butter from cooking further. Making cakes in skillets is easy to do and gives your cake a nice presentation when you bring it to the table as well. Make sure to butter your skillet generously so you don’t burn it. And use a dull knife or spatula when cutting the cake so as not to scratch the bottom of your pan. Demerara sugar is a type of cane sugar similar to brown sugar but with a larger grain and lighter color. It is great for sprinkling on top of cakes for a nice finish. If you don’t have it, don’t worry. Feel free to leave it out all together or replace with turbinado, brown sugar, or even crumble sugar cubes if you have those into larger crumbs. 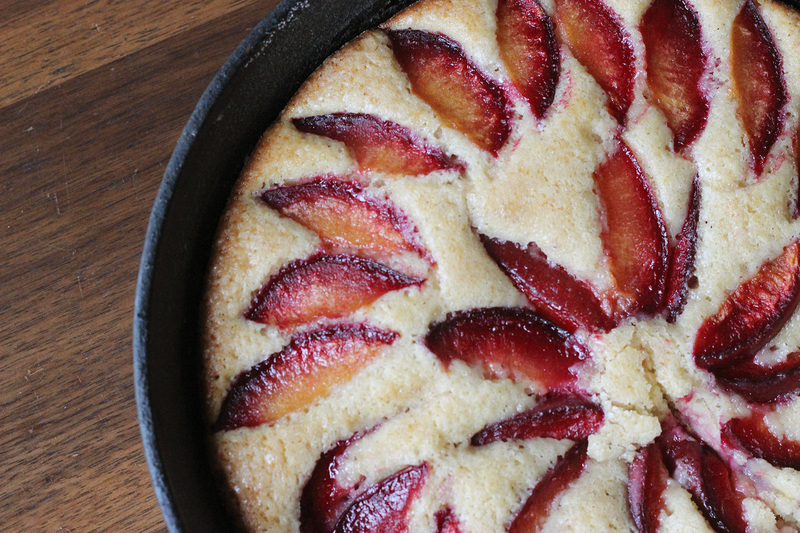 A quick and easy skillet cake recipe that is the perfect venue for any in season stone fruit. Try this with any variety of plum you find at the market or peaches, apricots, or nectarines. Would be perfect for a summer brunch or to serve next to a meal just pulled off the grill. You can adjust the sugar based on the sweetness of your fruit and feel free to sub different types of flour. In a small sauce pan (not the cast iron pan), brown the butter over medium-high heat. Set it aside to cool. Sift together the flour, baking powder, baking soda, and salt into a large bowl. Whisk in the sugar. In a medium bowl, whisk the egg until lighter in color. Add the buttermilk and stir to combine. Stir in cooled butter then pour liquid mixture into dry ingredients and stir until incorporate with a spatula or wooden spoon. Pour dough into the prepared skillet. Top with thin slices of plum in a spiral pattern then sprinkle with sugar. Bake in the oven for 35 minutes or until golden on top. Let sit in the pan to cool for at least 15 minutes before attempting to slice and eat.